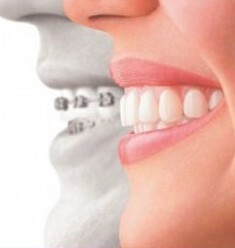 Straighten crooked teeth to prevent gum disease. I was at my gym this morning and got talking to a middle age lady in the changing room. I soon realised that she had Invisalign braces on, being a platinum provider of Invisalign I couldn’t resist but to ask her how is she getting on with her braces. She told me she had gum disease because her teeth were so crowded that they were hard to clean which led to puffy and bleeding gums. She told me that she was forever visiting her hygienist until she was advised to straighten her teeth with dental braces. Out of all the different types of braces available she thought Invisalign would suit her life style because it is so discreet. She has already noticed a considerable difference in her gums and finds them so easy to clean as her teeth are straightening out. So she is clearly en route to a healthy and straight nice smile! When adults have braces it is mainly thought that they are having them for cosmetic reasons, but that is not always true. Braces are recommended to prevent gum disease in those who find it difficult to clean between overlapped and crowded teeth. Gum disease in turn has been associated with many systemic illnesses. Plaque which causes gingivitis and periodontitis has loads of bacteria in it which are also linked with health problems such as stroke, heart disease and diabetes. So plaque removal equals to keeping gum disease at bay, however with crowded and overlapped teeth plaque removal with flossing and interdental brushes can be difficult to achieve. That is why we recommend Orthodontic treatment with braces to correct the alignment of teeth and once they are straighter plaque control becomes much easier. With so many different types of braces to choose from clear fixed braces are the choice of many adults and Invisalign is another very popular one. Healthy gums equates to healthy teeth because the gums and supporting bone around teeth act like foundations for them. Healthier the foundations, stronger the teeth are going to be. If gums and bone soften due to the activity of bacterial toxins the teeth are eventually going to get loose and then your oral health is on a downwards spiral. This can be easily prevented by visiting your hygienist or dentist and asking them for recommendations on prevention of this disease because we all know prevention is always better than cure. Need further info contact us! Love n care for now Aisha!